If this is the only thing I am good at I will keep mining the words. I will hack at them with what mental strength I have that my arms do not share. Everywhere is ugly. The ocean turns ugly, the palm trees turn ugly, the most beautiful old cathedral turns into yet another building you have to walk around to get to where you want to go. Picture the male university professor. I have him stuck in my mind. He is tall, bearded always, shabby but neat, well spoken. He leans against the front table in the room, always, he sits there listening, nodding, looking for more people to tell him what they think morality is and is it real or did we just make it up and is there a god and what do you think about what this German philosopher had to say 500 years ago please give me 12,000 words double-spaced by Friday at midnight to my email. I miss him, this authority figure who had all the answers and so many more questions. Your brain would never travel that far down a path otherwise. I was 17 when he announced to the class full of college freshman, “There are two very strong writers in this room.” I don’t particularly know why he needed to say it — doesn’t that make the other 50 people feel bad? — and of course he went on to point us out — doesn’t that make us feel bad? — me and another girl, both of us quiet little mental philosophers who enjoyed listening and reading more than anything else. Something Sylvia Plath wrote in her journal made me stop and think, I am listening to her, reading is listening. Writing is speaking. Hello, hello. I want to write a book. I want to make a movie. I want to learn guitar and make music. These things are beautiful to me, like old cathedrals. He tells me I don’t need to be so hard on myself. (Trust me, I’m not.) But what if that effort, that little mental push, is what draws the line between the successful author and the professor? I see two women walking together on the side of the road as I drive past, and I wonder if the woman waving her hands is talking and talking and talking too much, and if the other woman is regretting inviting her friend to exercise with her on this chilly late summer afternoon, since that’s what she really wanted to do, exercise, not walk slower than she normally would and listen to all of her friend’s updated life struggles. “My cat just won’t stop staring out the window,” I imagine her saying, waving her arms as she walks, pretending that she wants to exercise, too. And now the women are in my rearview mirror, I can look back and see them, and see the leaves turning orange or brown on the trees they walk under. People are already complaining about the cold, about how it’s almost fall and the weather is colder than it was a month ago, and I think about how this always happens, every year, everything. Hot in the summer, cool in the fall, cold in the winter, with snow, and the same fetching of the dusty snow shovel from the basement. I look in my rearview mirror at the beautiful orange leaves and I think about how I’ve seen this all before, seen those women before, or women like them, had those same experiences, talked about that same cat, seen those same leaves change from green to orange to brown, raked them into piles and jumped in them, or left the piles to rot. Again and again, year after year. “It’s so cold!” she says, another faceless woman in my mind, pulling on the sweater she hasn’t worn in nine months. Winter will come. Snow will fall. Salt trucks will melt it away, or try, or make ice patches that are worse than the snow was. Again, again, of course. And of course the people will go on, dealing with seeing their breath in the air on cold winter mornings, plowing through snow drifts and piles of paperwork and gallons of hot coffee. What else can they do? I’m not saying that is what happened to me, a sudden realization of great truth, but, the truth snuck up on me, at least. Or I was ignoring it, as it approached, attempting to wish it away, the fact that I’m missing something. You can tell yourself that you’re happy and whole, and do everything possible to keep up the ploy, but eventually, if you’re honest with yourself at least part of the time, you’ll find the truth for yourself, or someone else will accidentally shove it in your face, and, bam. Epiphany. Maybe. This is about friendship. This is about people. This is about life. This is about me, and relationships and reciprocation and a lack of both. Something missing, or everything. This is also a little about heart-break, or -ache, feeling a little of the magic of other people disappearing, feeling that that will never come back. This is about love, and not understanding what love is, and loving someone who loves someone else, and loving a few people who don’t love back. Missing all of that. This is about place, location. Wondering if I’d find this somewhere else, with a different city and a different group of people. Wondering if this is just another aspect of life, that this happens everywhere to everyone, wondering if I should feel wise instead of foolish. This is about choices, about choosing people. Choosing to hang out with those who make you feel happy with yourself, or at least feel something, not like something’s missing; not empty. This is about choosing the right people, about letting go those who make you lose your people magic, even though you don’t want to, even though you wish you could keep them. This is also about personhood. Being a person, being independent. But missing something. Being a person but not feeling like a person, not being treated like a person. This is about life, of course, because everything is. This is about learning. And this is about truth, if it even exists. Nothing like an epiphany, not quite. But, at least, understanding. You wake up and you feel it almost immediately. You try to shake it off, brush your teeth, eat breakfast; it’s still there. 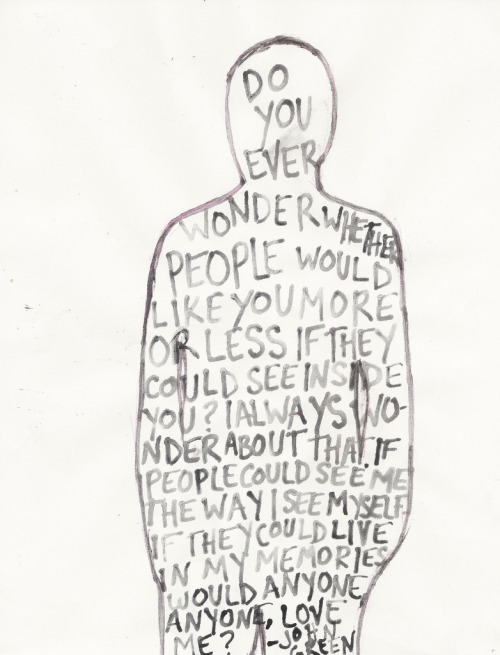 Maybe it’s in your house, along with all the good and terrible memories. You get in your car, drive away toward somewhere. Where can you go? Shopping? Maybe that’s how people become shopaholics. Addicts. Maybe they’re all the same. Maybe we could all easily become like them; we were just born into different circumstances — found ourselves in a better place when we popped out into the world, and now we all struggle to stay upright where our mothers left us. You pull into the mall parking lot. You turn off your car, but you know you’re not going in, so you roll down your window and sit still for a few minutes. It feels a little better. But running away doesn’t solve anything. What you’re looking for can’t be purchased at any store. Time is the only thing that helps. Time passes you by out the car window; people march in and out of the store, lugging out bags full of things they may or may not need. You put your seatbelt back on; you’ve sat there long enough, let enough time go by, and it’s still the same and it still will be the same for quite some time. You could call someone. A friend. But it seems that these days all of your old friends are busy living their own completely different lives. It just doesn’t work anymore. Maybe you need to meet new people. Maybe you need to move. Anything to avoid staying here and falling slightly down, becoming something else. What were you born to be? This? Maybe new friends can’t help you. Maybe a new city can’t help you, either. Maybe nothing can. Maybe everything is just a cover-up, just a distraction. Just like sleep. That’s why you feel it the most in the early mornings, when you can still hear the birds chirping in the dying trees across the street, before the motors start and don’t stop until well after nightfall. That’s why some days, when you don’t have a calendar full of tasks to complete before you head back to bed, when you wake up and look at the clock and realize how many hours are going to stretch out in front of you, you feel it. Life. Just living. What the birds and the squirrels would feel if they had brains like we do. Emptiness. Or, rather, not emptiness. A lack of something that is full of something else. An empty fullness we try to cover up with the society we’ve created. With the laws, the stop signs, the uniforms of employees and school children. With religion. With purpose; an easy purpose, one-size-fits-all, that can be found in several different very old books. And, of course, with shopping.